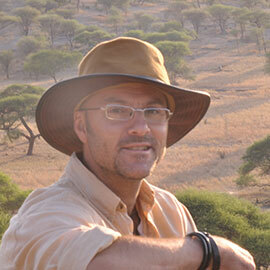 Christopher Huggins has been awarded a Banting Postdoctoral Fellowship to hold at Laurier for his research examining the use of information communication technologies (ICTs) to promote climate change adaption in Africa. Huggins, who earned his PhD from Carleton University in 2014, will be hosted at Laurier in the School of International Policy and Governance (SIPG) at the Balsillie School of International Affairs (BSIA). The Banting fellowship is a two-year postdoctoral award that provides funding to exceptional postdoctoral applicants to contribute to the Canada’s economic, social and research‑based growth. Only 70 of these fellowships are awarded across the country each year. Working with Dr. James Orbinski, Centre for International Governance Innovation (CIGI) chair in global health, and the 2030+ Research Group at the BSIA, Huggins’ research examine the relationships between climate change, technology and health in Malawi. He aims to make a contribution to this work by looking at how ideas of nutrition feed into ICT platforms for agricultural climate adaptation.